The RTI NEO ONE modular laser systems for professional applications and lighting designers were first published at Prolight + Sound last year. This year, they were featured on the PRG Stage in their Highlight show. Simple, yet very effective DMX / ArtNET control makes the RTI NEO ONE compatible to existing control infrastructure, no other control system is required. 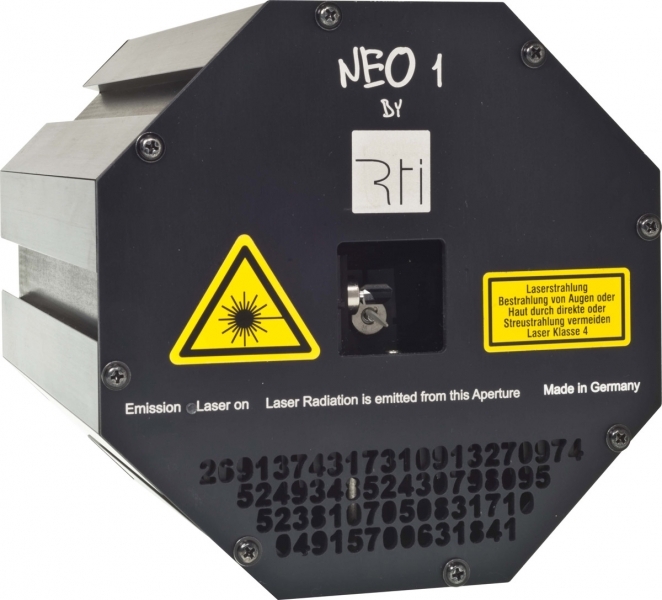 The RTI NEO ONE is designed as a multi-projector-laser-system: Several units can be attached to each other with a quick-lock system. Due to the octagonal shape it is possible to create shapes built of laser systems. They can not only be mounted at uncommon positions, e.g. flanking the sound line arrays on big stages, arranged as circle or in other shapes, but can also be used as high power laser array. 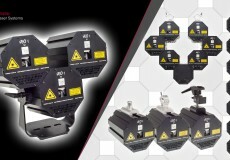 The RTI NEO ONE is an extremely powerful white light full color laser system. With a power of ca. 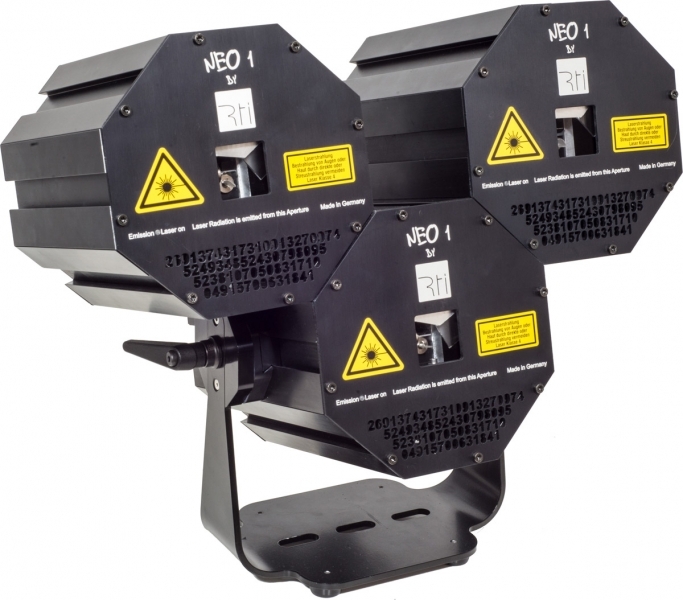 20W RGB per meter or 3.3W RGB per unit it is also well suitable for large scale applications: The RTI NEO ONE have ten times more power per aperture than the RTI NEO SIX – and those have proven multiple times to be sufficiently powerful for large stages. Besides the DMX controllability, the RTI NEO ONE has a built-in controller that can either allow for direct control of the lasers through laser software, or provides additional playback features. It can be individually configured with custom patterns or animations (free software for creating ILDA patterns is included). The high speed scanning systems allow graphics and logo projections as well if required. 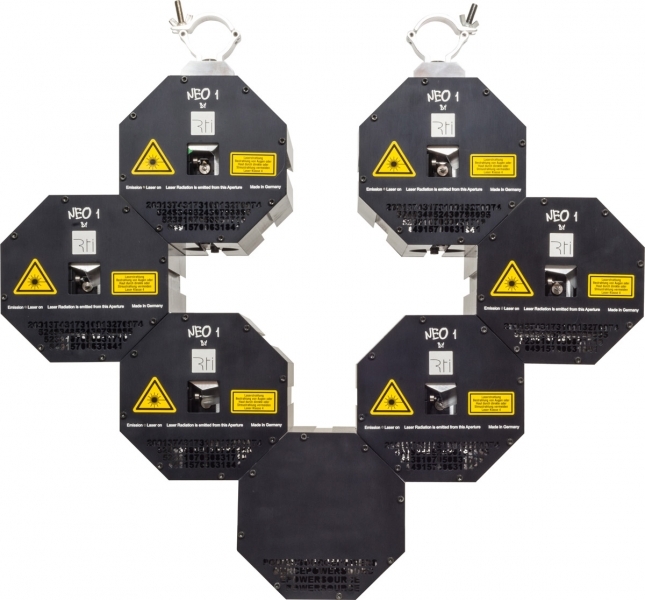 Up to six units of the RTI NEO ONE can run with one power supply. 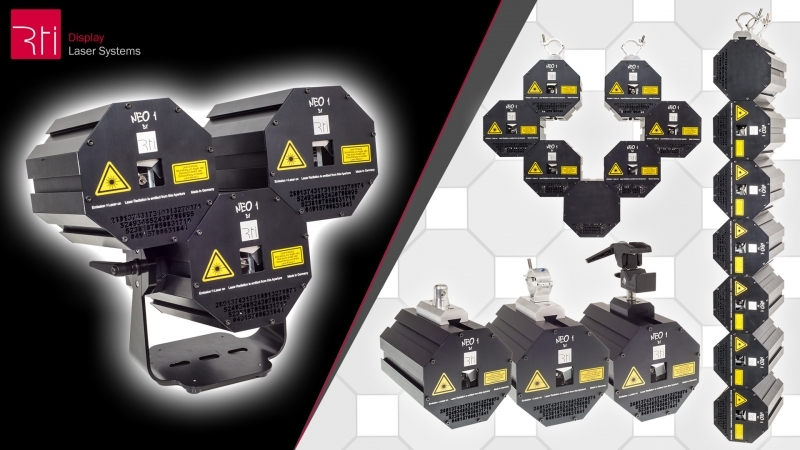 Units and power supply have the same octagonal shape, thus they’re easily combined with the same type of quick-lock mounts. The dimensions of the RTI NEO ONE are very compact: Only 220x185x185mm at a weight of only 6.5kg make it easy to use many of these units with a small footprint. 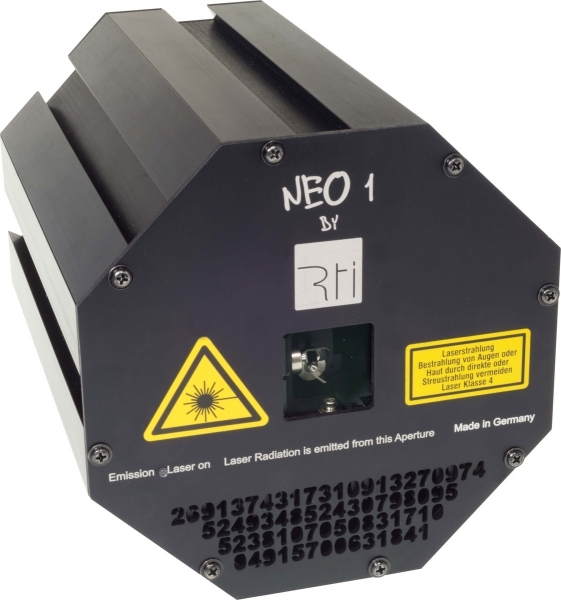 The RTI NEO ONE was especially designed to be run as an array, matrix or for creating shapes of lasers. The capabilities of these systems exceed the ones of the RTI NEO SIX by allowing more power and even more flexible ways of using them. 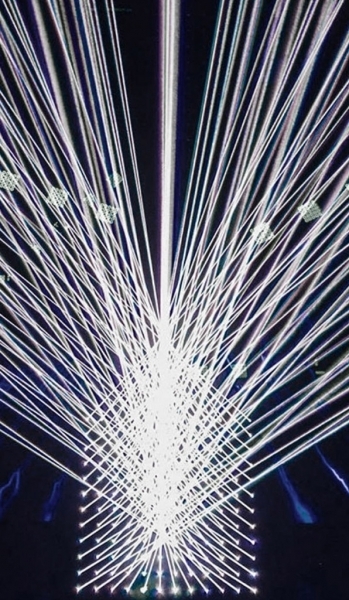 Especially lighting designers and professional production companies use these laser systems to create new, innovative lighting effects, designs and moods.